You can just tell that fall (and love) is in full bloom on this clear and crisp October wedding day. 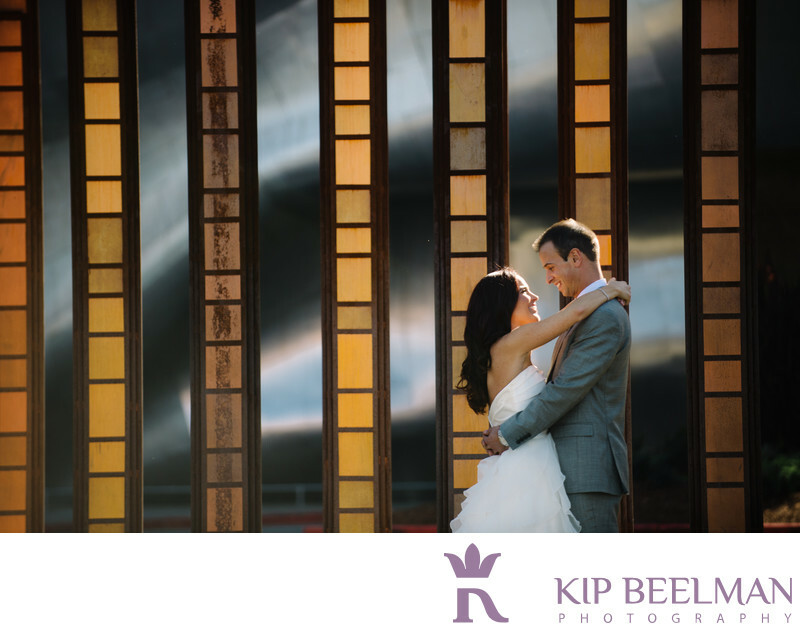 The warm colors glint and softly shimmer for this Experience Music Project wedding photograph that I took in the Seattle Center with my 70-200mm lens. I love the warm tones of the building, the light in the air and the smiles on the bride and groom’s faces during this wedding portrait tour of the city. You can also see how beautiful the bride’s dress is and how happy the bride and groom are as they share an embrace. The wedding ceremony to follow took place at Parsons Garden, located atop Seattle’s Queen Anne neighborhood and surrounded by stately homes and panoramic views of the Seattle skyline, Mt. Rainier and the Olympic Mountains. Complete with its wisteria bower, open grassy lawn, sweet benches and flowering trees, Parsons Garden is known as a placid oasis in the heart of Seattle’s Queen Anne Hill. Parsons Garden is a hidden gem that is part of Seattle’s park system and offers an instant dose of color, charm and magic for weddings and Seattle wedding photography. On this lovely fall day, it provided a beautiful backdrop to many beautiful moments of celebration. Location: 7th Ave W & W Highland Dr, Seattle, WA 98119. Keywords: Garden Wedding (15), Outdoor Wedding (72), Parsons Gardens (3), Ray's Boathhouse (3), Seattle (111).